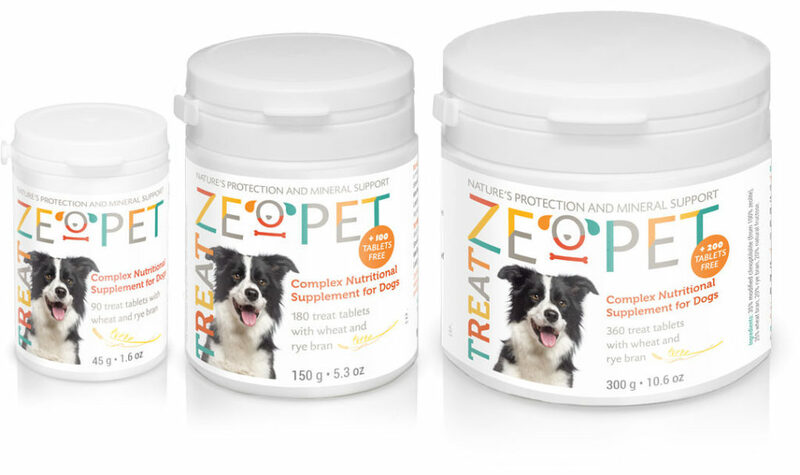 ZeoPet Treat is a complex nutritional supplement for pets with a special composition for dogs of different breeds. The contents of this supplement provide it with a natural flavor that every dog will love. It’s produced from natural, high-quality Zeolite mineral in a special spatial configuration – Clinoptilolite – and a complex of wheat and oat bran with natural fructose as a natural flavor ingredient. ZeoPet Treat is an effective natural sorbent (cleaner), ion exchanger, and source of biologically active essential substances. When ZeoPet Treat enters the animal’s digestive tract, it improves the excretion process of dangerous pollutants and toxins, normalizes the digestive system, and enriches mineral and general metabolism. By absorbing heavy metals, radionuclides, inorganic toxins, and wastes of various origins, zeolite provides the animal’s body with essential microelements and valuable mineral components. The bran components of ZeoPet Treat are a source of roughage, fiber, Vitamin B, polysaccharides, and microelements (mainly selenium). Selenium is an essential microelement and key antioxidant which makes DNA synthesis possible. The most valuable polysaccharide is beta-glucan, which binds fatty acids in the dog’s intestine and reduces cholesterol levels, hence protecting the animal’s cardiovascular system.